This LED Sign Display is Suspended On a Cable System! Buy Retail and Restaurant Advertising Equipment at Everyday Low Prices on this Site! Each LED Sign Display, also Known as a Poster Grid, Has an Edge-Lit Glow! Acrylic backer and overlay are fixed together with decorative hardware to form a slim LED sign display. Silver cable system components stylishly contrast with the black face of each signage panel. LED sign display is illuminated with Light-Emitting Diodes, which consume less energy than neon illumination. Ceiling-to-floor matrix has a modern and unique design that will appeal to today's consumer. This LED sign display, similar to light boxes, will bring graphics to life with bright backlighting! Constructed from acrylic, each signage holder features a two-panel design consisting of a backer and overlay connected with decorative black hardware. 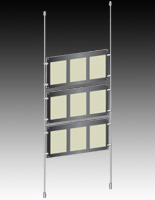 The backer of each LED sign display has the lighting components embedded behind the viewable area of each poster. A light diffusion pattern evenly disperses lighting throughout the visible area of the graphics, so no hot and cold spots or shadows can be seen on the posters. The LED sign display has a backer with beveled edges that illuminate. A black border on the front of the acrylic overlay creates a soft glowing effect by deflecting the edge lighting of the backer. This backlit signage matrix is far more energy efficient than similar types of neon signage or traditional light boxes. As a result, the business advertising with this LED sign display grid will reap the benefits of reduced energy expenses and an environmentally friendly image in the eyes of consumers. Consumers are continuously exposed to a bombardment of graphics when passing through any commercial district. The key to attracting walk-in customers for each business is to find a captivating LED sign display that stands out from the competition! This signage matrix is just the right tool for increasing the number of customers and revenue for any business depending on face-to-face customer sales. Why is this LED sign display more effective at communicating with a target market segment than other types of storefront advertising fixtures? A combination of product features contributes to this unit's effectiveness. 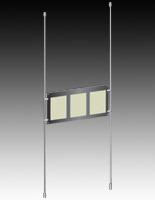 First, the thin light-up panels create a matrix far sleeker than traditional light boxes with heavy metal framing. 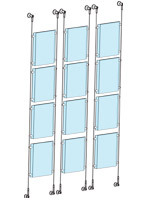 Additionally, the sleek design of the individual panels combine with the silver cable system components creates an innovative, almost futuristic-looking matrix that is unique compared to other types of storefront window signage, such as neon signage or older-style light boxes. Please Note: Posters printed on a translucent material are recommended for use in these light boxes in order to maximize the effect created by the LED backlighting. 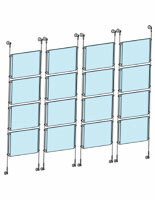 Each panel has a power supply that requires a standard outlet.